The Cisco 8800 Series is one of the newest addition to the Cisco family. The 8800 Series IP Phones cut the costs with affordable HD video phones for any and all organizations. It provides the consumer with crystal-clear VoIP. It lends employees more flexibility with corporate telephones and personal devices. The Cisco 8800 Series delivers an affordable and scalable expansion of a programmable line and feature key appearances for the 8851, 8861, and 8865 endpoints. Keys can be customized for frequently used telephone features such as speed dials, one-button-to-push access to most contacted colleagues. Also supporting shared-line appearances between administrative staff, knowledge workers, managers, and personal interaction with inbound callers. 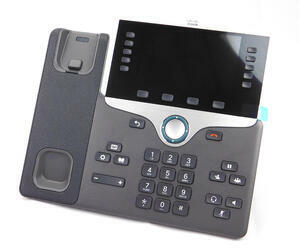 The IP Phone 8800 Key Module enhances productivity with a simple and efficient line of communication. Session Line Mode (SLM) user experience for easy transition from past Series (8900 and 9900). 18 programmable LED line and feature keys. Second-page key provides 18 additional lines and feature keys per module. The Cisco IP Phones 8800 Series 8811, 8841, 8845, 8851NR, 8861, and 8865 provide extensive features to customers around the world. Many are standard and can be used by users with disabilities. Your phone comes with standard accessibility features that require NO setup. Find detailed information on accessibility features found as part of Cisco 8800 series IP phones below. 2 Line and feature buttons are to the left of the LCD. Session buttons are to the right of the LCD. Use line buttons to start, answer, or switch to a call on a particular line. Features such as speed dial, line status, privacy, do not disturb, and service URL's can be assigned to feature buttons. Your administrator can set up these features. Use session buttons to perform tasks, such as answering a call or resuming a held call. 4 Softkeys: Large buttons just below the LCD Provide access to special functions displayed on the LCD. 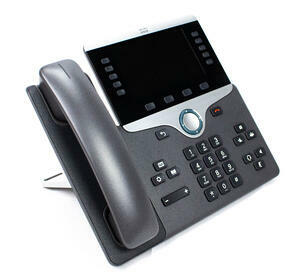 The Cisco 8800 Series provides Voice Feedback which helps people who have trouble seeing; use their Cisco IP phone. When enabled, a voice prompt helps you navigate the IP phone buttons. The voice also speaks the outgoing and incoming caller ID’s. Your phone comes with standard accessibility features that require no setup. Press Applications and select Phone information. The Model Number field shows you the phone model, IP address, hostname, active and server information. If you run into any issues, report your problem to the network administrator. 2 Large Buttons to access Applications, Messages, Contacts, Holds, Transfers, and Conference calls Allows you to easily access your phone applications, voice messages, corporate and personal directories, and calling features. 3 Built-in Speakerphone Indicates whether the speakerphone is on or off. A light will indicate whether the speakerphone is in use. 4 Tactile-discrenible buttons and functions, including a nib on Key 5 Allows you to easily locate your phone's keys. Key 5 has a nib which you can use to locate other key positions. Wall Mounting Video Series: Used to mount a single video phone on the wall. For more information on Cisco 8800 Series IP Phones, or other Cisco telephony, contact our sales team by clicking below or by giving us a call at 888.747.4847!